I am reading “Creating a World Without Poverty” by Muhammad Yunus, winner of the Nobel Peace Prize. I am astounded at the depth and simplicity of the ideas for creating a bank for microcredit and microloans. His move from teaching economics at a university in Tennessee to teaching in his native country of Bangladesh to visiting a poor village led to observations and practical steps for helping the poor. The system which evolved honors women, as they spend their money in the community and on educating their children. It has a 98% payback rate where traditional banks have a 70% payback rate. There are community support systems which have evolved. It is based on micro-preneurism, tiny businesses which have taken hundreds of thousands of families out of poverty in the two decades of operation. The Sixteen Principles which the bankers practice encourage education of children as soon as possible. 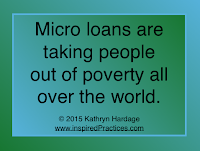 There are even micro loans for beggars, 100,000 loans and 10,000 people are no longer beggars as a result. During the floods which affected two-thirds of Bangladesh, it took five months for people to resume their loan payments as they were rebuilding. Grameen Bank worked with them so they could get additional funds for rebuilding. There have been other offshoots reaching into the communities of poor people, businesses which Dr. Yunus calls “social businesses” whose purpose is to improve the lives of their clients. These “social businesses” are run like a business to pay all the expenses of the business and to make a profit, but the main purpose is what the business does for its’ clients. I am only eighty pages into this book but I have already ordered two more by this author. It was interesting to compare the steps of public policy in the US to what I am learning about in this book. Entrepreneurs on the micro level seem like a very powerful concept which is documented to be working all over the world.